If you are looking for fast, precise and a clean concrete cutting service, CA Drillers is the place to be. With more than 35 years of experience in diamond wire sawing and cutting industry based in the UK, our wire sawing specialists have successfully accomplished a large number of different types of projects all across the country. We work together with construction businesses to cater to their particular concrete cutting and drilling needs. Regardless of the complexity involved in the work, our skilful resources and latest diamond cutting equipment make us capable of fulfilling any challenging project needs of our clients nationwide. 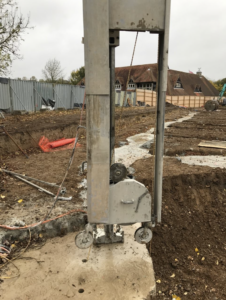 If you want to remove a large area of heavily reinforced concrete at a location where there are access restriction and speed as well as a depth of cutting are critical factors, diamond wire sawing is the ideal solution. For instants, if you want to cut a large section of columns and beams in a bridge deck ensuring excellent speed and extensive depth of cutting, then diamond wire sawing & cutting is the right alternative. When track saws fail to deliver the desired result, consider wire sawing as the perfect choice. The technology is also commonly used in the construction industry to cut flush to existing walls. It is also a perfect alternative to traditional stitch drilling. In Diamond wire sawing and cutting, a wire permeated with diamond beads is wrapped around the structure to be cut and run through a series of pulleys to perform cuts. We can use wire of any desired length to obtain any required depth. Using this diamond encrusted wire and pulley system, we can cut any awkward shape much easier and faster way. While cutting operation is on, the pulley system auto adjusts the tension to achieve desired depth of the cut until the job is finished. The wire saw can be operated from a remote distance so increases the safety onsite. The technique is also used to cut concrete or any other construction material located beneath the water. In short, when no other cutting or drilling technology fits the project, wire sawing makes the right choice. Using diamond wire sawing technology, there is no damage caused to the surrounding structure onsite. We are a most prominent diamond wire sawing & cutting contractor offering our services in London, Kent, and surrounding areas. Want to learn more about our diamond wire sawing services or expertise? Contact us today!